I've decided to write up a short post describing my methods for performing certain tests. This will allow me to link to this in my reviews and be more transparent about how I do things. Today, I'm going to go through how I test a charger to graph the charge voltage and current. This is the most important section of this post - I am not an electrical expert. What I'm showing here has plenty of flaws I am aware of, and may have some that I have not considered. This is not meant as a guide or a description of the proper way to perform a test. This is only a write up of how I currently test a charger with the equipment I have. 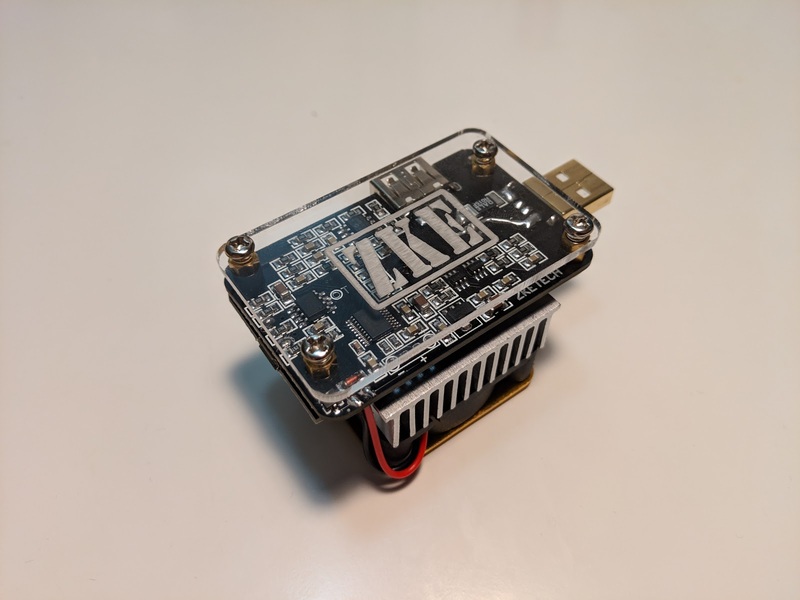 The only specialised instrument I use for tests is a ZKE EDB-USB+ (referral link) available under a number of names on Amazon. This was originally bought as a versatile USB tester, but the logging capabilities have proven useful for the tests I'm showing today. Aside from that, I use one female USB-A to bare wire cable, and one male. I also use a 'dummy cell' made of polycarbonate. To hold the wire leads to the cell I am charging, I use a spare charger with the terminals covered in tape. The tester I have was not modified from it's original state. 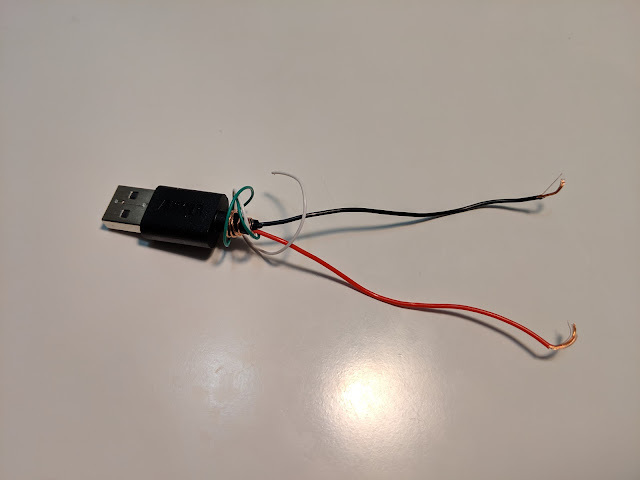 The two USB cables were made by taking a spare cable, removing the outer insulation, and stripping down to the red and black wires. For the USB-A female cable, an OTG cable was used. The 'dummy cell' was made to help keep solid contact with the charger terminals. It's just a length of 1" polycarbonate with one screw in either end. 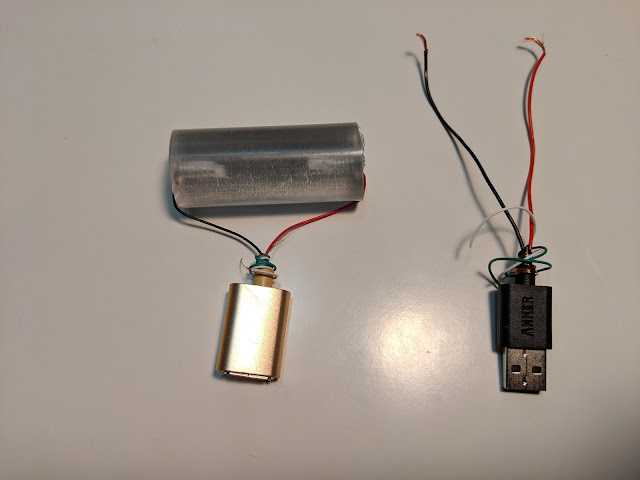 In use, the dummy cell sits in the charger being tested and is connected to one side of my USB tester. The cell being charged sits in the spare charger, and is connected to the other end of the tester. The tester has a separate USB cable connecting it to a PC. Once this is all connected, the charger detects the cell voltage just as it would if it was installed directly, and charging begins. 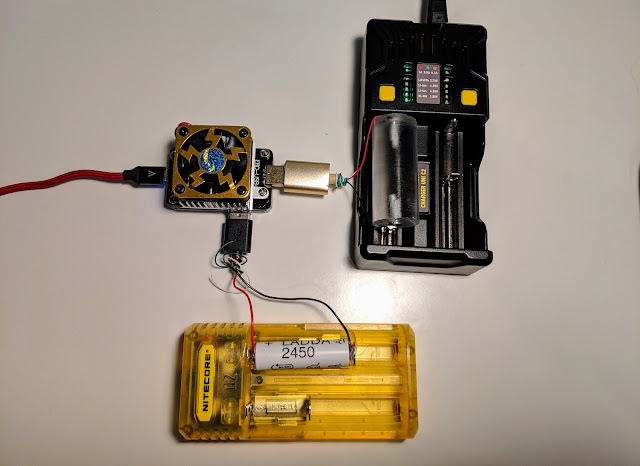 While the cell is charging, the tester records the voltage and current, tracking both over time, and graphs them on the PC with the included software. The software included with this tester also allows for power measurements, measures the capacity, and supports exporting the data as a .csv. An added benefit of the graph showing up in real-time is that I can remote into my desktop if I'm in another room to check on how the charging is going. The result of this is a curve showing the charge current and cell voltage throughout the charge cycle. To me, the most important part of these graphs is noting how the cell voltage changed over time, and seeing if the termination voltage was appropriate. The current is a good measurement to see if the charger properly slowed down as the cell approached a complete charge, and to see if the charger picked a good current for the cell being tested. As I've already noted, this setup is far from ideal. The biggest disadvantage is that the USB cables I am using add a fair amount of internal resistance to the measurement. 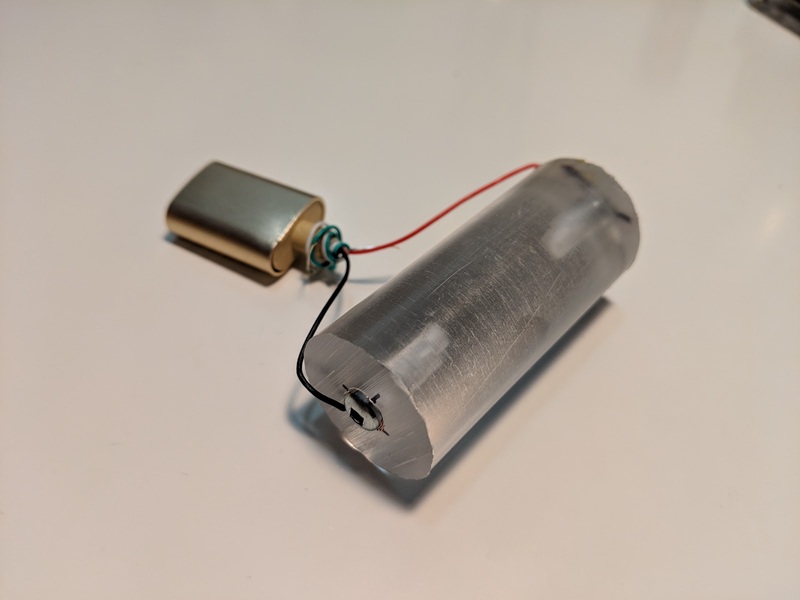 The resistance at each pole is about 0.3 Ω. This can lead to inaccurate current measurements. Some chargers use the internal resistance of a cell to determine the appropriate charge rate - in these cases, this setup just won't work for testing those higher currents. Another important note is that some chargers measure the temperature when charging NiMH cells to determine when to terminate the charge. Since the cell is not directly inserted, these chargers could overcharge cells of that chemistry. 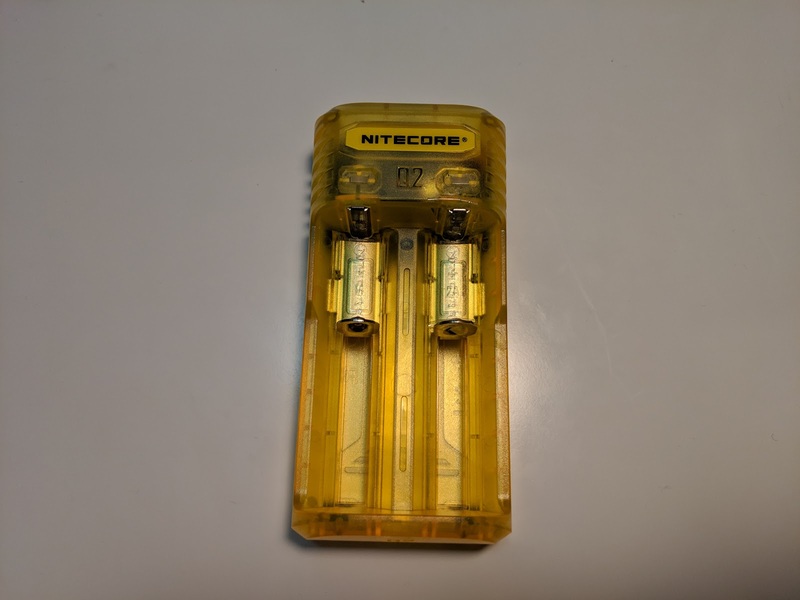 A smaller issue is that my dummy cell is 1" wide, so it won't work in smaller chargers that don't support 26650 cells. If I run into that issue, it shouldn't be difficult to find some smaller scrap material kicking around somewhere. Anything that can reduce the resistance of this circuit would improve the measurement accuracy. If I can find a USB cable with thicker leads, I'll start using those instead. The next step up from this would be using a proper logging DMM in place of a USB tester. 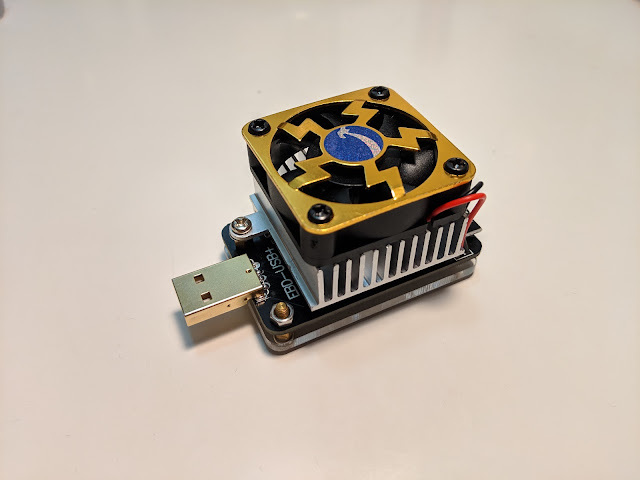 To me, the Mooshimeter (referral link) seems like the perfect candidate for this, since it takes standard leads and can record voltage and current at the same time.